As part of our History curriculum series, and as a complement to December’s post on collaborative curricula, Cynthia Wallace-Casey discusses New Brunswick’s unique diverse, regional, and bilingual approach to History and Social Studies curricula. (2) The role of the legislature and government of New Brunswick to preserve and promote the status, rights and privileges referred to subsection (1) is affirmed. In this sense, education and cultural identity operate hand-in-hand. For each linguistic group, school is not simply about “making the grade,” it is about preserving and promoting social responsibility to two linguistic communities. How such dynamics play out within New Brunswick’s social studies curriculum, is through respect for regionalism and diversity. 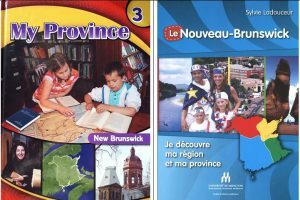 Regionalism, in that New Brunswick joins with like-minded provinces to share curriculum resources; and diversity, in that the province’s two curriculum narratives reflect distinctions within New Brunswick’s linguistic communities. This is further supported by the pedagogy involved with Peter Seixas’ six concepts of Historical Thinking. Battles over grand narratives are fruitless, and undermine diversity in history education. Consider, for example, the historical perspective of New Brunswick’s provincial identity. As with other jurisdictions within Atlantic Canada, provincial identity is taught in grade 3. New Brunswick, however, supports two distinct narratives on provincial identity, shaped by two distinct linguistic communities. This distinction is not simply a matter of translation; it is a matter of historical experience. Likewise, on a national level, the historical perspective of Francophones within Canada cannot be summarized as same for all. New Brunswick’s French linguistic community, for example, does not share the same colonial experiences as other Canadians—and even within this community there exist regional distinctions between Brayons and Acadians. Within the complex world of linguistic and cultural divides, settler colonial interactions with Indigenous peoples were not historically the same either. In the building of such national narratives as A Peoples’ History and The Story of Us, these are the voices that are too often lost. These are the voices that can be found, however, through place-based history education. So if adopting a common national narrative is not realistic for Canada, what is? I believe that sharing place-based curriculum resources (not just textbooks—as is currently the case), and adopting national standards of Historical Thinking, are two realistic avenues for collaboration. That is why The Historical Thinking Project is so important for Canada’s social studies curriculum. Historical Thinking represents a significant paradigm shift in how we design Canadian History curriculum in Canada. In the region of English-speaking Atlantic Canada, the provinces of New Brunswick, Newfoundland and Labrador, Prince Edward Island, and Nova Scotia, have been working together through the Council of Atlantic Ministers in Education and Training (CAMET) since 1993 to establish a shared social studies curriculum. Their objective is threefold: 1) to improve the quality of education for all students through shared expertise and resources; 2) to insure that the education that students receive across the Atlantic region is equitable; and 3) to meet the needs of both students and society (CAMET, 1999). The resulting Foundations document for Atlantic Canadian Social Studies was first published in 1999 and authors credit their inspiration from the 1994 Curriculum Standards for Social Studies in the United States (CAMET, 1999, p. 1). Since this first publication, however, the Atlantic Canada Foundations document has been revised to adopt Seixas’ (2006b) concepts for Historical Thinking. While the current curriculum framework continues to evolve as a collaboration-in-progress, it provides a valuable model for standardization (as Cutrara has already pointed out), because it shows how provinces and territories can work together (as a region) to adopt a common methodology for historical inquiry. Likewise, this same curriculum framework also demonstrates how uniqueness need not be forfeited in the process. This is because each of the Atlantic provinces has adopted a place-based approach to historical inquiry. The resulting curriculum framework is deeply rooted in the perspective of where students live. As such, the curriculum (up to grade 9) is primarily student-centered and driven by students’ interests. It is also structured around key-stage outcomes (targeting grades 3, 6, 9 and 12) that are formative in nature. These features provide for a great deal of pedagogical space in recognizing regional diversity. How this curriculum plays out in the classroom, for example, is through such activities as Heritage Fairs (supported by Canada’s History Society) that are very popular in Atlantic Canada. Ultimately, by grade 9, all English-speaking students within each province learn that Atlantic Canada is interdependent—and functions as a unified regional community within Canada. The social studies curriculum for New Brunswick’s French linguistic community is distinct from that of the Anglophone world. It does not draw from the Atlantic Canadian framework, but rather a pan-Canadian framework for cultural appropriation in French-speaking schools in minority settings (CMEC, 2012). Guided by Canada’s Charter of Rights and Freedoms, New Brunswick affirms a legal responsibility to maintain distinct and equal educational institutions for two linguistic groups. French language educators in this province recognize that language is much more than a communication tool: language also serves as a tool for learning, thinking, and identity-building. How this philosophy plays out in the primary level social studies classroom, is that New Brunswick’s French-as-a-First-Language schools have not been so quick to adopt Seixas’ (2006b) concepts for Historical Thinking. 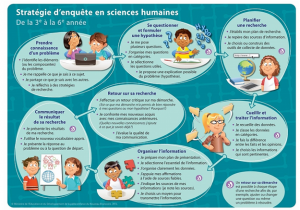 Instead, Francophone educators favour a model for Historical Consciousness that more closely resembles Catherine Duquette’s (2012) taxonomy for historical thinking, which in turn correlates with Seixas’ (2006b) six concepts of Historical Thinking. This reflective taxonomy begins with a problem—which leads to a question—that initiates critical historical inquiry—and ultimately leads to re-evaluation of the original problem. Francophone educators in New Brunswick favour a model for Historical Consciousness that more closely resembles Catherine Duquette’s (2012) taxonomy for historical thinking. Image credit and copyright: Province of New Brunswick, Department of Education and Early Childhood Development (Francophone Sector). New Brunswick’s French linguistic community represents approximately one third of the province’s entire student population. It shares a unique historical experience that is distinguished as Acadian. Acadia historically represents a geographical area that includes present-day New Brunswick, Nova Scotia, and Prince Edward Island. Acadians trace their colonial history back to 1604, when the first attempted permanent French settlement in North America was established on Saint Croix Island (near present-day St. Stephen). Significant benchmarks in their history include The Great Deportation of 1755-1759, a 19th century Acadian Renaissance, and 20th century Language Rights. These historical experiences have led New Brunswick’s French linguistic community to develop a curriculum that features a uniquely Acadian perspective on the past. Translation: In a world where grand narratives have a hard life and where new myths replace the old, young francophones surveyed in this study perpetuate an image of Acadia shaken by 1755 [the Acadian Deportation] but since rebuilt in its own way. By grade 12, as Marc Robichaud’s findings suggest, French-speaking students within New Brunswick have learned that they are part of an Acadian diaspora—that transcends provincial borders and functions as a unified regional community within Canada. How can uniqueness be found within Canadian History curricula? The duality of New Brunswick’s education system has much to offer the rest of Canada. In responding to Samantha Cutrara’s question: How is uniqueness found within a collaborative Canadian History curriculum? I give you the example of my province, where collaboration can lead to common methodologies for historical inquiry. At the same time, uniqueness is upheld in New Brunswick through respect for regional and linguistic diversity. New Brunswick’s example demonstrates that, on a national level, we need not adopt a common national narrative for Canadian History—that by its very nature becomes exclusionary; we can, however, adopt a common national language for historical inquiry. The Historical Thinking Project provides educators with a starting point for such collaboration, but it is only a starting point. More empirical research is required at an academic level, as to how these Historical Thinking concepts are employed in students’ places of learning (both in the classroom as well as the community): What are the national narratives that students construct? Are there distinctions between linguistic groups? Where are the national standards for assessment in history education? And how does Historical Thinking specifically prepare students for 21st century citizenship? Note: The author would like to acknowledge that this work was created on the traditional unceded territory of the Wolastoqiyik. This territory is covered by the “Treaties of Peace and Friendship” which Wolastoqiyik and Mi’kmaq peoples first signed with the British Crown in 1725. The treaties did not deal with surrender of lands and resources, but in fact recognized Mi’kmaq and Wolastoqiyik title, and established the rules for what was to be an ongoing relationship between nations. Duquette, Catherine (2012). The connection between historical thinking and historical consciousness: Proposition of a new taxonomy. Unpublished PowerPoint presentation. Duquette, Catherine (2015). Relating historical consciousness through historical thinking through assessment. In K Ercikan and P Seixas (Eds. ), New directions in assessing historical thinking (pp.51-63) New York: Routledge. Robichuad, Marc (2011). L’histoire de l’Acadie telle que racontée par les jeunes francophones du Nouveau-Brunswick : construction et déconstruction d’un récit historique, Acadiensis XL(2), 33-69. Seixas, Peter (2006a). What is historical consciousness? In R.W. Sandwell (Ed. ), To the past: History education, public memory, and citizenship in Canada (pp. 11-22). Toronto: University of Toronto Press. Thank you for this, Cynthia. Clearly, the francophone community in the province attaches great significance to historical education. Readers may also wish to be aware that this is not so much the case in anglophone New Brunswick, where Canadian History is no longer a required subject in the high school curriculum and is taken as an elective by only a very small minority of students. Meanwhile, Canadian history continues to be a graduation requirement in the francophone high schools. Apart from the missed opportunities for the many benefits of historical education, it seems to me that anglophone high school graduates are accordingly less prepared to live in their own province, or country, and less prepared to participate effectively in public discourse. Over my years of teaching Canadian history at the University of New Brunswick, I have drawn this default in policy to the attention of successive ministers of education but without positive response, or in some cases any response at all. Thank you so much for your comment David – I agree with you fully… and this still needs to be addressed with policymakers in New Brunswick.